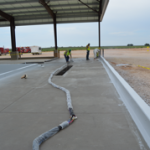 The project was a new concrete wash bay for acid tanks, consisting of 3500 sq. feet. 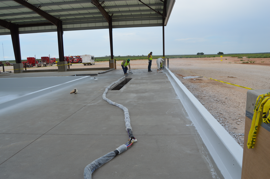 The overall condition of the concrete was in good shape with no major defects. 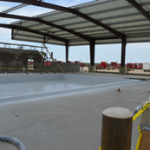 The project started on Friday September 2nd with Sealtec abrasive blasting the new concrete structure. 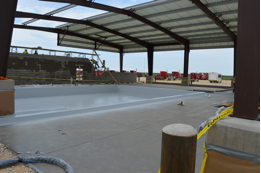 On Tuesday September 2nd, Sealtec primed the structure with Raven 175 two-component epoxy primer. The average mil thickness was 5 to 10mils. 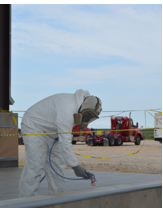 On Wednesday September 7th, they began spraying the Raven 410 HCR and broadcasting aluminum oxide into the coating for safety. Applying two coats at 60mils each completed this. 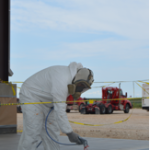 The first coat was sprayed out and the aluminum oxide was broadcasted into the coating. After the first coat was tack free a 40mil topcoat was applied to lock in the aluminum oxide. The total coating thickness averaged 80mils. The project concluded on Thursday September the 8th. The structure was visibly inspected for holidays and patched with 410 HCR when they were found.